The rules, designed primarily for mid century conflict are eminently suitable, as is, for early century warfare. However, there were a few nuances of early century combat that led to important developments later in the century that are not fully reflected in the rules. Here then, is our unofficial modifications for the Era of Marlborough. 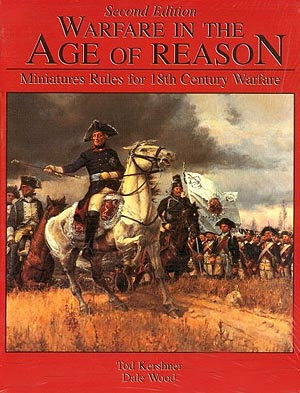 These minor changes are meant as a guide for those who would like to game this period's flavor, but with the full character of the rules system of Age of Reason. 1 turn represent a slot of time from 5 minutes to 1/2 hour. There were two very different firing systems in use in the first part of the century. Those nations adopting a "platoon Firing" system, and those adopting the "Volley Fire" system. These two systems produce very different frontages of units. 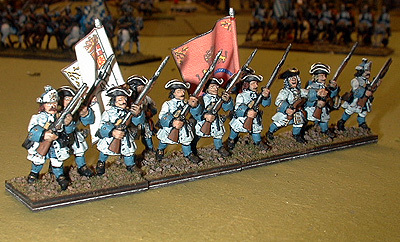 Volley fire platoons use a deeper, narrower formation. This is reflected in the basing diagram. Horses are mounted on a narrower frontage. 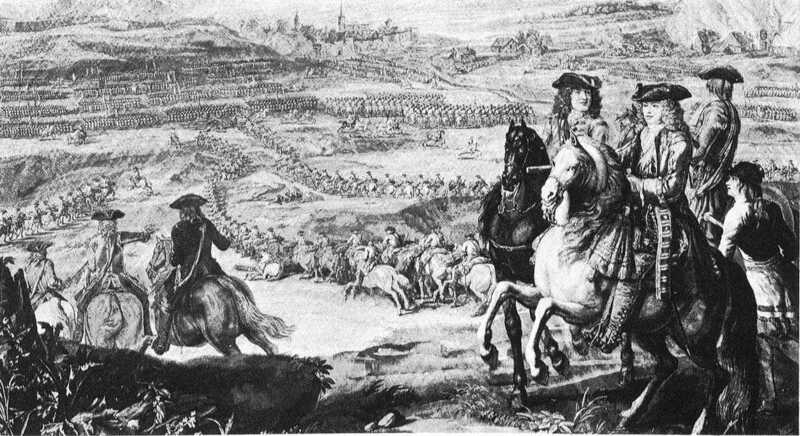 Look at this contemporary engraving of the storming of the Schellenberg to get a better idea of the very narrow “cheek-to-cheek” formation of the horse. The narrower frontage we employ not only reproduces this look and feel, but also allows one to field squadrons at a realistic frontage. Under nominal circumstances, the units are represented as shown on the right, However, in certain circumstances, battalions were very under strength, For example, at the Battle of Blenheim, the French battalions were very under strength, having an average strength of some 300 - 350 men per battalion. In these circumstances, the battalion sizes given on the examples on the right, may simply represent a regiment of two smaller battalions or 1 larger one. 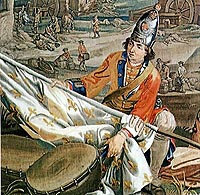 The nominal strength of an Austrian regiment, to cite another example, was 2,200 men typically organized into three battalions. However, when the regiment was under strength, rather than three smaller battalions, they would be re grouped into 2 battalions. Most battalions had one or two grenadier companies deployed on the flanks of the battalion, which we model for aesthetic value. They add no special factors to the unit but provide some variety. Under some circumstance outlined later, these Grenadiers may have been banded together to form all Grenadier formations. These were ad-hoc formations usually done to support siege actions or other specialized situations. This represents the Battalions of those nations adopting firing by platoons. It is the basing as is given in The Rules. It represents 480 -720 men in three ranks occupying a frontage of some 819 ft. 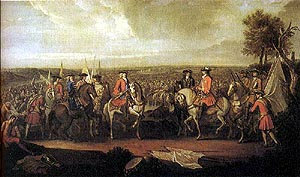 It is the typical formation of Holland, Prussia, England (Scottish and Irish regulars in the English Army - British Army (from 1707) and possibly Denmark in English or Dutch pay. The basing is 1½" frontage by 1" depth. Typically 12 figures. This represents those battalions using the volley fire system, in its earlier form. This represents 480 -720 men in 5 ranks occupying a frontage of 390 ft. This was the official formation of France, Spain and used also by Portugal and some German States. 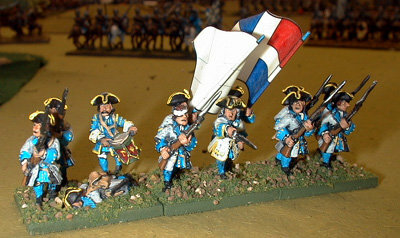 It was not formally changed to the wider volley fire width (below) by France until 1707, however, many battalion commanders ignored the 5 rank formation and adopted the more useful 4 rank formation (below). The basing is 1½" frontage by 1¼" depth. Typically 12 figures. This represents those battalions using the volley fire system, in its later form. This represents 480 -720 men in 4 ranks occupying a frontage of 486 ft. 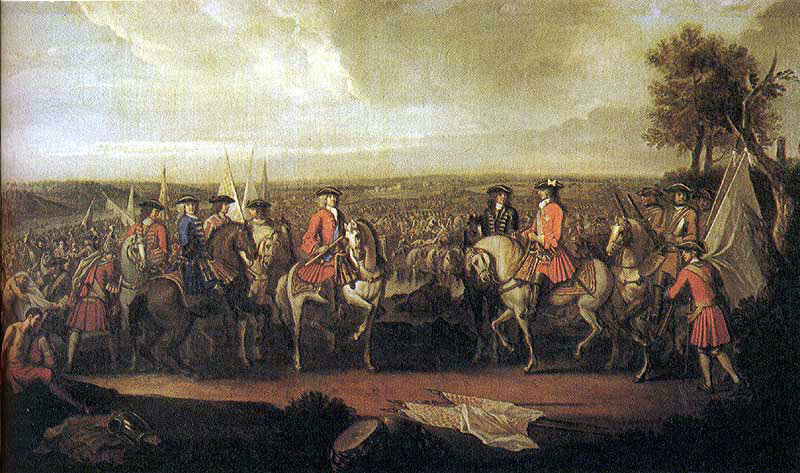 This formation was in use by Austrian and many of the German states from early in the war, but was not officially adopted by France until 1707. However, many battalion commanders ignored the official 5 rank system and adopted this more useful 4 ranks system. 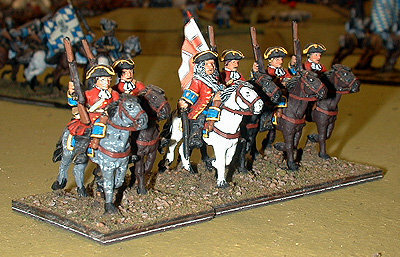 4 Squadron Bavarian Cuirassiers Regiment. Foundry Figures This represents horses on a narrower base than provided by the rules (1½" frontage by 2" depth). This basing requires a slight staggering of the figures with some manufacturers, to make them fit. It does however provide for a more realistic frontage and appearance (see engraving). Typical squadron strength was 120 men, which fits withy our figure scale. 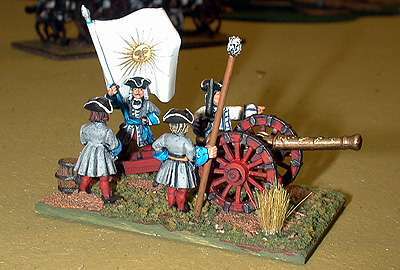 French Company of 4 Medium Guns. Old Glory Gun, Artllerists from BloodAxe and Foundry. This represents a battery of 4 guns. It is based on a 2" frontage with a 3" depth. The gun is not affixed, so can be replaced with varying sizes of gun. The gunners can also move away, leaving the gun on the field. Limbers in this period were usually contacted civilians who were not likely to stay on the field after the guns were deployed. It appears that artillery pieces listed in contemporary orders of battle also include the "light battalion guns" that were often operated by individual infantry battalions. Therefore, when using the army listrs from WAOR, the listings for artillery pieces (light guns) include battalion guns. For those units that fielded battalion guns (as designated by the lists) the light guns must be distributed among them. Light guns, fielded from the army lists include battalion guns of 4lb and less where required. Medium guns are those of greater than 4 LB up to 6 LB in projectile weight. Heavy guns are those of 8lb – 12lb and occasionally 16lb or 18lb of perhaps lesser quality. Siege guns are those of nominally 24lb or greater, and mortars. BOLD represents a change from the rules. Italics represents an addition to the rules. Medium field pieces may be prolonged 2 “ per turn. Heavy field pieces may be prolonged 1” per turn. Medium, and Heavy guns all have a long range out to 30”. These rate guns could all fire out to 1200 meters with fairly equitable accuracy. This range change is to compensate for the lack of limbers, which leave before the start of the battle. Howitzers are medium guns that can be moved as light field pieces. They have no “partridge shot” range (referred to as “canister shot” in the rules). All artillery may be deployed 18” in from edge of board (on a 5 feet wide table) for an attacking army, or 24” from the edge for defending army. Siege Artillery may not be moved after deployment. It may only pivot on a turn in which it may not fire. Light breach loading guns from the army lists of Savoy, Austria and Hungary add +1 die for their faster rate of fire. Those horse as designated as “Charging at Trot” by the army lists, subtract 4” from their charge move. Those horse designated as “Pistol Firers while Charging” test to fire pistols on entering melee. The following results result in their opponents being successfully disordered by pistol fire at contact with the resulting negative melee modifier. Horse with carbines, may stand and receive charges from other horse at the halt and issue carbine fire. 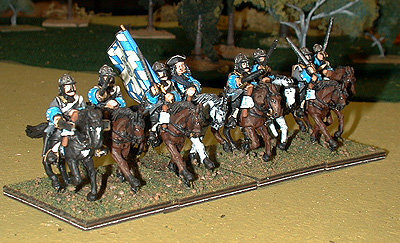 Dragoons may not dismount during game – but may, at Generals (or scenarios) wish, start the game dismounted. One Dismounted Dragoon unit per side may at start of the game attempt to take a forward terrain position (no closer than 24” from enemy board edge). Side declares unit and terrain feature. If both sides choose the same feature, both dragoon units start 3” back from feature (and must fight over it). Any dragoon unit that elects this option must take an immediate morale check at start of game from the position of the terrain feature - and follow the results. Foot may wheel, only at half speed. This was a difficult procedure before the reintroduction of the cadenced step. Foot may not incline (same reason). Foot may only about face, or wheel, it may not turn to flank. Battalion Squares may not move. Volley fire units’ initial fire, was by all accounts quite formidable, but fire control was quickly lost. Platoon fire tactics provided a steady stream of accurate fire. Therefore the following factors replace first fire factors from list. All nations' foot units may fire to their rear at -3 (as per square side) to reflect firing while retiring. They may do this even at a full move (cumulative with moving modifiers) and if in either column or line. There are no other modifiers. This is to reflect that dragoons Vs any non dragoons on horse should be inferior due to poorer quality horses, or if on foot, due to lack of bayonets. All dismounted Dragoons use volley fire. Additional Small Arms factors for Horse. Mounted units designated as armed with carbines may "caracole". This allows them to fire all ranks of a column or two squadron wide line, to reflect that the front units peel off after firing to allow the following ranks to fire. Notes of Flank/Rear Support and Frontage. For flank support, a friendly unit must have some part of a flank base edge (or friendly contolled terrain) within 3" of the testers' flank base edge. For rear support, the supporting unit must be directly behind the testers rear and close enough that the supporter can reach the tester with charge movement (without wheeling). The supporter must be parallel to and facing in the same direction of the tester. Hits on a unit represent the gradual degradation of a units ability to stay for the battle due to gradually worsening resolve to stay and fight. They do not represent dead on the battlefield. A unit that has taken 75% "loss", should be interpreted as a unit that has taken 75% of the degradation necessary to force a compulsory rout form the table. Of course, it may fail a morale result long before this. When calculating frontage (as a melle factor), a unit that has 75% "loss" has not lost 75% of it men - it may have only lost 25 soldiers, but it has taken a 75% reduction in the resolve necessary to stay and fight. Frontage in melee is therefore the frontage in unit width (in inches), not in number of figures. Any variation in the size of units due to casualties is represented in the "pip dice" roll.